It’s that time of year when an avgeek’s thoughts turn to airshow season. And you really can’t talk about air shows without talking about EAA Airventure which, as everyone knows, is so much more than just an airshow. 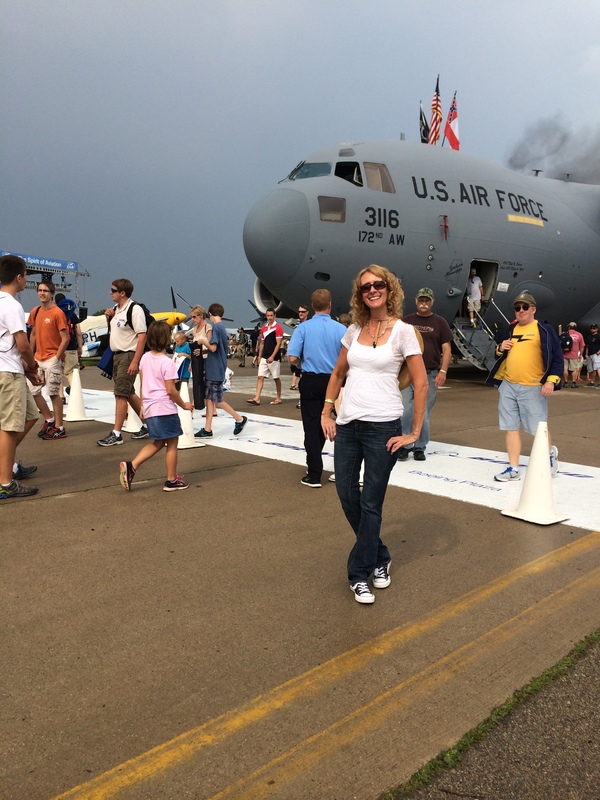 I made the pilgrimage to Oshkosh for the first time last year and loved every minute of it. As I begin planning a return trip to Osh this summer, I thought it would be fun to take a look back and share my first impressions from Osh 2014. 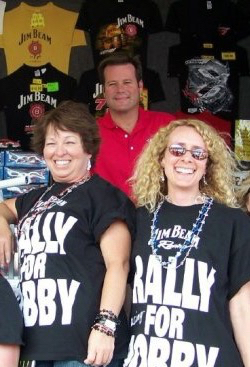 Thelma, Louise and Robby Gordon… from a long time ago. – Taking an exit ramp on two wheels. In a Durango. – Hanging out with Jack Roush (which is quite a story – look for a future post). – Hanging out at a bar with Robby Gordon and his girlfriend. – Ending up in a variety of restricted or closed areas we’re not supposed to be in, usually completely unintentionally. Usually. It should be noted that Dianna is not an avgeek – she agreed to come along to Osh because we always manage to have fun and adventures wherever we go. 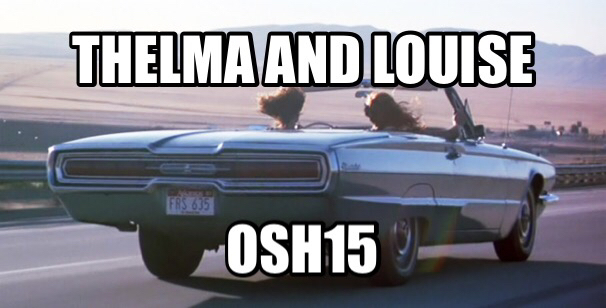 And what’s Thelma without Louise? I couldn’t imagine making my first trip to Oshkosh without her! We started seeing the airplanes about 30 miles outside of Osh, at which point I immediately began freaking out. Thankfully Louise stayed calm which allowed us to actually make it to Osh without ending up in a ditch (but just barely). My first impression upon seeing the grounds was something along the lines of OMG-LOOK-AT-THIS-PLACE-ITS-HUGE-AND-LOOK-AT-ALL-THE-AIRPLANES-HOLY-COW-THE-AIR-SHOW-HAS-STARTED-WOW-I-CANT-BELIEVE-IT-I-AM-SO-EXCITED! Because we arrived late in the afternoon, we ended up parking rather far away. 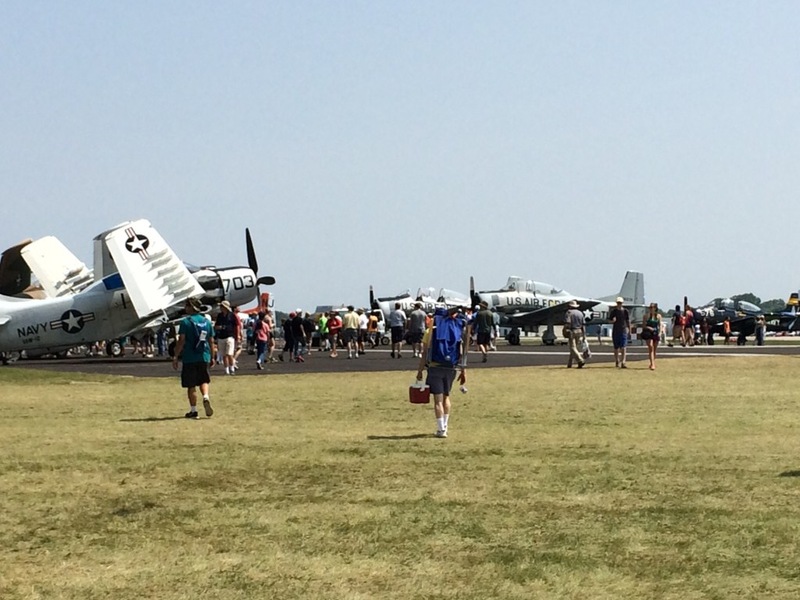 I have to give a HUGE shout-out to EAA and all the volunteers because we didn’t have any trouble at all getting our wrist bands or finding the right shuttle – and that’s saying a lot because by then I had more or less completely lost my mind. The first thing I saw upon entering the grounds was the Citation display – some of my very favorite business jets! From that moment on I was 100% completely in love with Airventure. The rest of Friday was a blur. We watched the airshow, checked out some displays and spent time just generally getting our bearings. After dinner we made our way over to the vintage planes for a while and then we joined in the honor flight festivities. Needless to say, it was pretty late by the time we finally made our way to the hotel. In fact the manager was about to give up on us. Good thing he didn’t! I would have hated to add “breaking into a hotel” to our list of misadventures. So much to see and do… mind blown!!! No wonder we lost the car. Yeah… it took half an hour of wandering in the dark but eventually we found it. I bounced out of bed bright and early, eager to get back to Oshkosh. Louise needed a bit more prompting. She’s not an avgeek, remember? But she is a tremendous good sport and we arrived back at Airventure mid-morning. We had outlined a basic game plan for the day. First off we wanted to find the war birds. And secondly we wanted to attend a welding class. Yes, you read that correctly – a welding class. 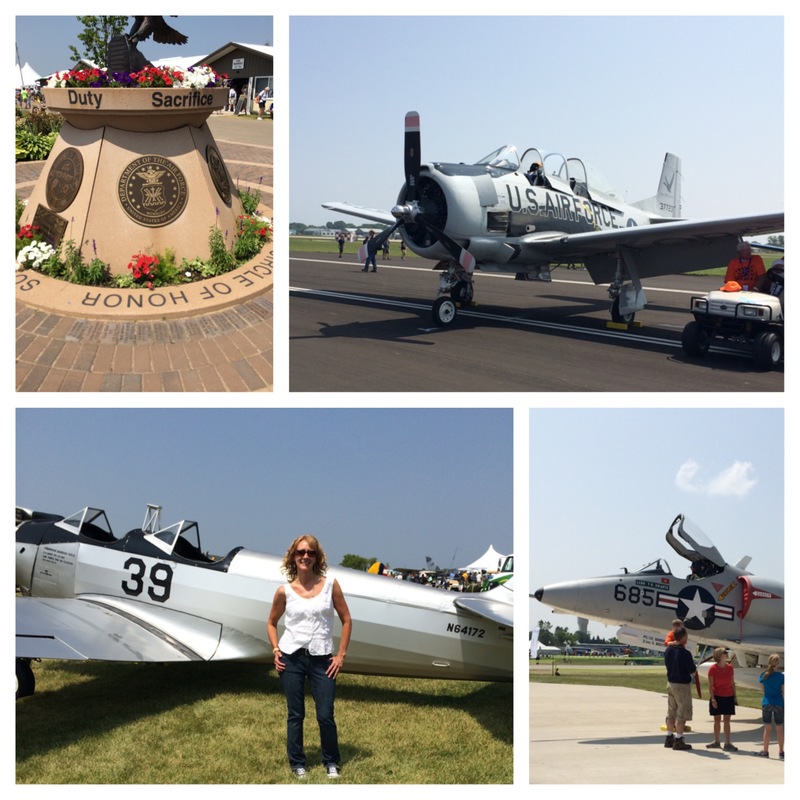 From the moment we arrived at Airventure on Saturday we were determined to head straight to the war bird area. But then we decided we really had to stop by and see how the One Week Wonder was coming along first. And we had seen some items the day before that we wanted to purchase so we spent a little time in the vendor area. Next thing we knew, several hours had passed and we hadn’t gotten anywhere near the war birds. Doh! We resolved to double our efforts! But we couldn’t do it on empty stomachs so we stopped to eat. And we had to visit the college area where the schools were handing out information about their aviation programs (O-H!!! I-O!!!). And then there was just a little more shopping to do. 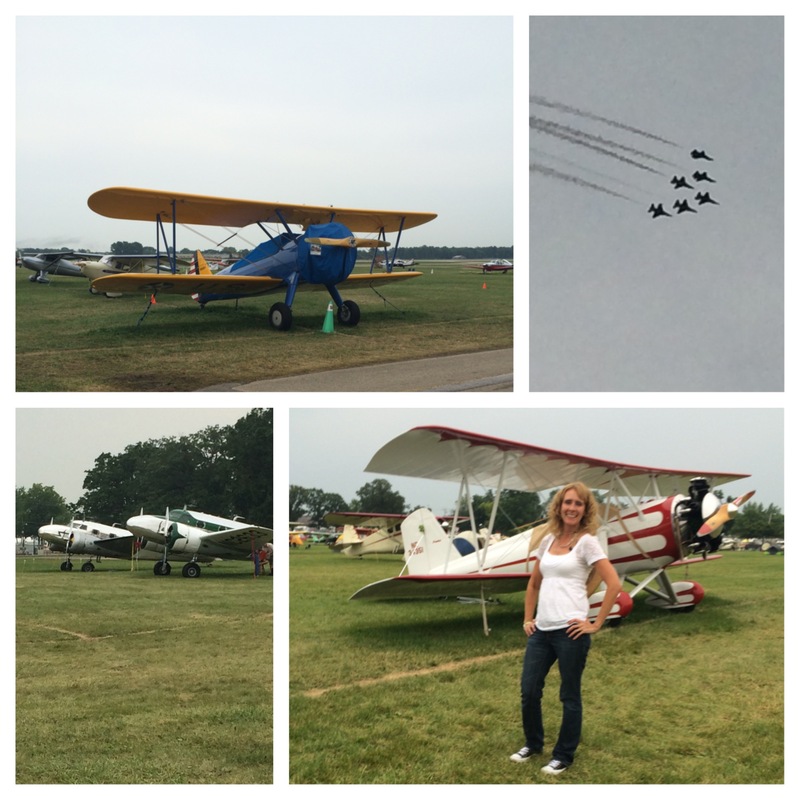 (How on earth does anyone visit Airventure for just a day???) At long last we finally got to see the war birds and they were every bit as awesome as expected. You do NOT want us welding anything important. Or anything at all, actually. 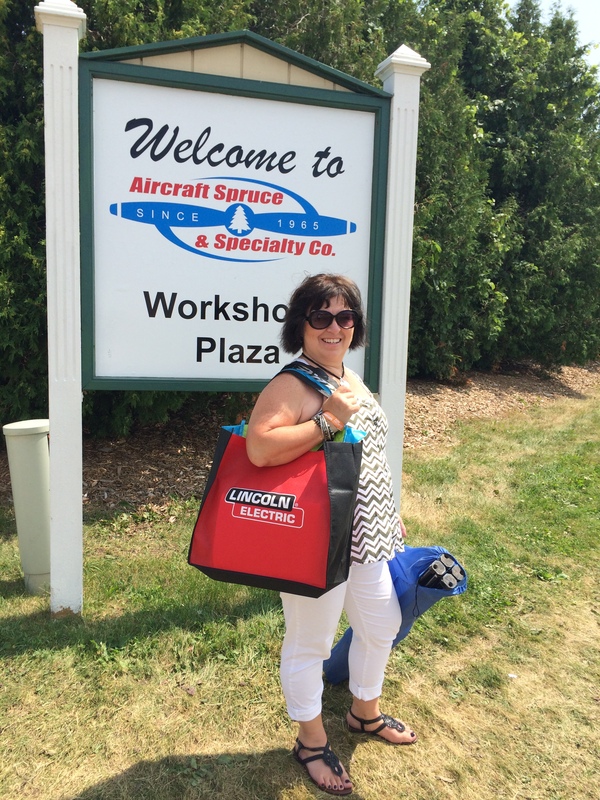 But this Lincoln Electric bag does look darn good on Louise! I could have spent the rest of the day checking out the vintage war planes but before we knew it, it was time for welding class. So we reluctantly said goodbye and headed over to the workshop plaza. Unsurprisingly, we were late. Oops! Fortunately the good folks at Lincoln Electric didn’t seem to mind. We found seats in the back and dutifully reviewed our packets of material. The most important thing I learned in welding class is… well OK, I was on complete airplane overload at that point and I don’t remember a darn thing about welding class other than the fact that we attended. And they gave Louise this really cool bag. After welding class we settled in for the afternoon air show. Amazing planes, aerobatics, an Osprey and the Thunderbirds – it doesn’t get any better than that! Well, how about a night time air show? Oh hell yeah! Once it got dark we donned our flashing pirate necklaces (because who goes to a night time air show without a flashing pirate necklace?) and waited excitedly for the action to begin. 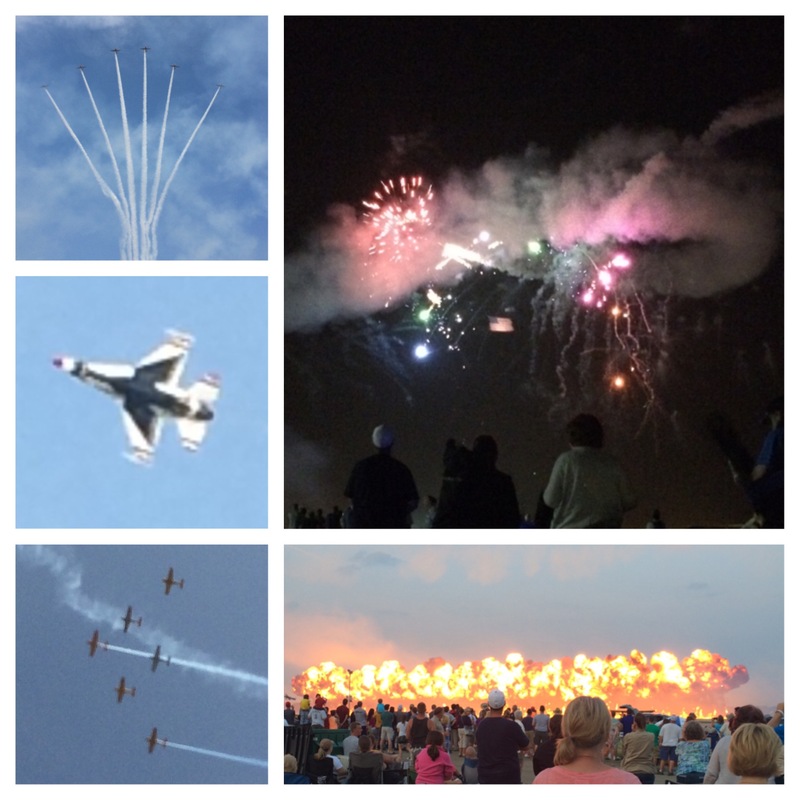 I had never seen an air show at night before and had no idea what to expect. I think the experience can be summed up in three words: A. MAZ. ING!!! 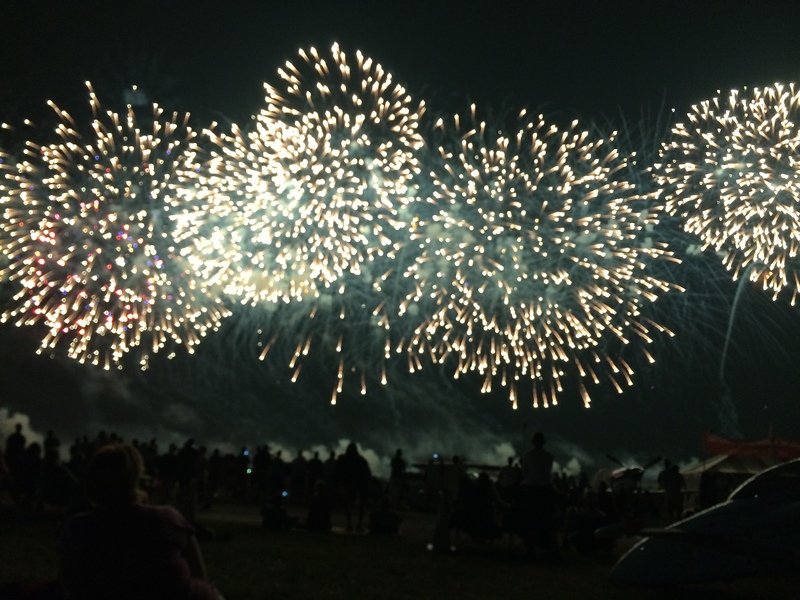 It combined all the awesomeness of the day show with fireworks and explosions. Enough said. We made the long drive back home on Sunday. I arrived at my house Sunday night totally exhausted… and completely ready to do it all again! I knew right away that a return trip to Osh was in order – after all, we never got to see the home built or ultralight planes, never made it to the seaplane area, didn’t get to attend Oshbash, failed to visit Camp Bacon… the list goes on and on. This year the plan is to arrive earlier in the week, stay longer and try to see and do things we missed last year. And yes, Louise is definitely in. Hope to see you there! It was fun reading your post about Osh, it got me excited to go back too! You must check out the Osh Seaplane base… it is the best kept secret! Thanks Brittney! The Seaplane base is definitely on my MUST SEE list! Oh my goodness YES! How awesome would that be? I’d drag you to welding class just for the fun of watching you ask questions in Russian!!! Well it IS Osh – there’s lots to be excited about! REALLY hope you make it there some day soon! And I agree – you absolutely have to fly in. Hope to see you there! It is not good for me to get this excited about planes right before bedtime. I need to start going to airshows with people like you that really love it as much as me. I want to go so bad. Maybe someday I will control my life instead of the Air Force. I hope you get to go too David! And thanks for reading! Would love to go to Osh and have many friends that have gone! That said, I am attending the PARIS airshow this month and went to the Farnborough Airshow last year. If you are in Europe I recommend Farnborough highly. The Paris airshow is the oldest of them all. Farnborough is held in even years, Paris in odd years.